I'm running low on Zenbits... which is a sad statement about how I need to get out more. I'll keep posting the ones I have (and new ones I take), but I'm going to intersperse them with a new set of photos that make me smile- photos of art my kids make that is surprisingly profound. You parents know what I mean: the art your kids create that you look at and see something a little more than what is actually there. The teachers assembled the parts, but Petunia placed them. I love the helter skelter arrangement combined with the lines from the glue- it makes me think of a snowman blown apart in the wind. Love it! It's totally amazing what kids can do art-wise when adults resist the urge to get involved. I just started photographing DS' art and it's really fun to look at things through the lens. I just updated today on FB that my new plan though is to make cards from DS' overabundance of paintings. They're starting to pile up and I'm a bit worried if I don't get it in control now, it never will be! @the milliner- I like the cards idea! We can't keep up with the art coming home from day care. So we just pick out our favorites and keep them in a big portfolio. The rest get thrown out. Someone even coined a word for that- "garboflage"- the practice of hiding your kids' art in the garbage so that they don't notice you're throwing it out. Ditto @ the milliner. Instead of arts and crafts, Tate loves to take pictures. He is in total control of the digital point and shoot and I love the pictures he ends up with. He's got his own blog now where I put up his pictures to look at with him. @Cloud, Heeee...'garboflage'. I was just contemplating this the other day. How do we throw out the tissue box robot we made a few weeks ago without him noticing ?! ;). My other plan for how to get rid of stuff is to let him play with it (he usually ends up ripping it or destroying it so I feel less guilty about throwing it out). And he's into a big learning-how-to-use-scissors phase, so I've been giving him the non-saver artwork to practice on. @Mom2boy, that's awesome that Tate loves to take photos. And an even more awesome idea of giving him his own blog. I may steal that idea! What age is/was Tate when you started that? @ the milliner - He's been asking to take pictures every time he sees someone with a camera for as long as been able to make that request known, but really gotten into using it all by himself and then checking to see how the picture turned out just recently - he's three and a half. The blog went up a couple of weeks ago. 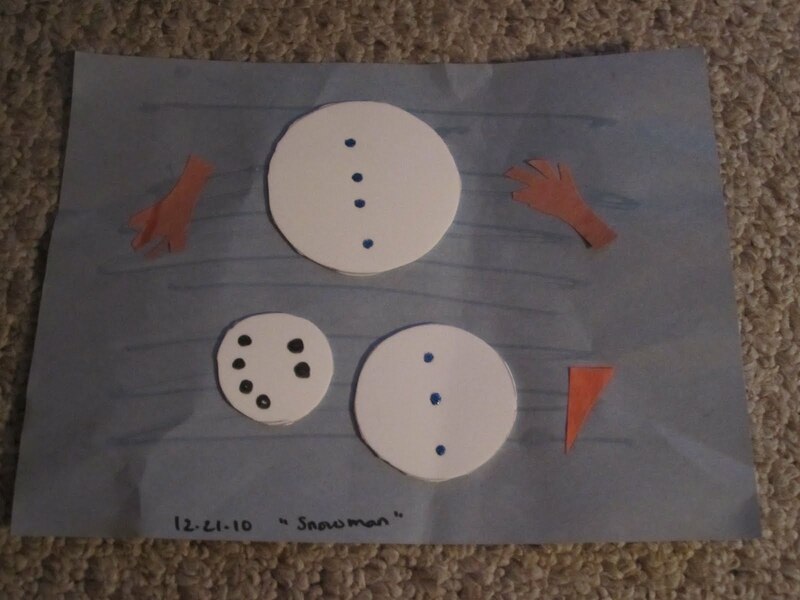 I love the snowman! I think I have a very picasso-esque Santa Claus around here somewhere from Rosie's toddler days. Annie doesn't do much in terms of art yet... the stuff that comes home from daycare is clearly too good to have been done on her own. @mom2boy, Rosie loves taking photos too. Most are lousy but the odd one turns out really artistic. Particularly when she's taking photos of food or of body parts. I've actually considered putting some of them up on my blog. Very nice work. I like their effort.